It is important for patients with diabetes to have dilated eye exams once a year to detect any signs of diabetic eye disease as soon as possible. You can also minimize your risk of developing diabetic eye disease by keeping your blood sugar and blood pressure under control, eating a healthy diet and exercising regularly. Diabetic retinopathy is the most common diabetic eye disease and is a leading cause of blindness in adults. Diabetic retinopathy develops as a result of changes in blood sugar levels or simply the presence of long-term diabetes. 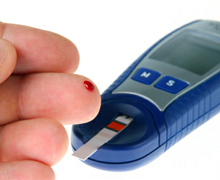 Most patients don’t develop this condition until they have had diabetes for at least 10 years. If high blood sugar levels cause blood vessels in the retina to leak blood or fluid, the retina may become swollen and form deposits. Patients with proliferative diabetic retinopathy usually seek laser surgery to treat their condition. This treatment is known as scatter laser treatment and is used to shrink the newly developed abnormal blood vessels using up to 2,000 laser burns in the area of the retina. This treatment is usually performed in two or more sessions because of the high number of laser burns necessary. Scatter laser treatment is most effective before new blood vessels have started to leak, and may slightly reduce patients’ color and night vision, while preserving your central vision. Severe bleeding may require a vitrectomy, or removal of the vitreous, to remove blood from the center of the eye.